In 2012 GSA sent a grant of £500 for the purchase of books for the Wechiau mobile library project. Frank Dugasseh sent his thanks and greetings for 2013 with an update on the project and a picture. Wechiau is in the Upper West Region, on the border with Ivory Coast. The Black Volta River runs nearby and Wechiau is well-known for its Hippo sanctuary and its many bird species. 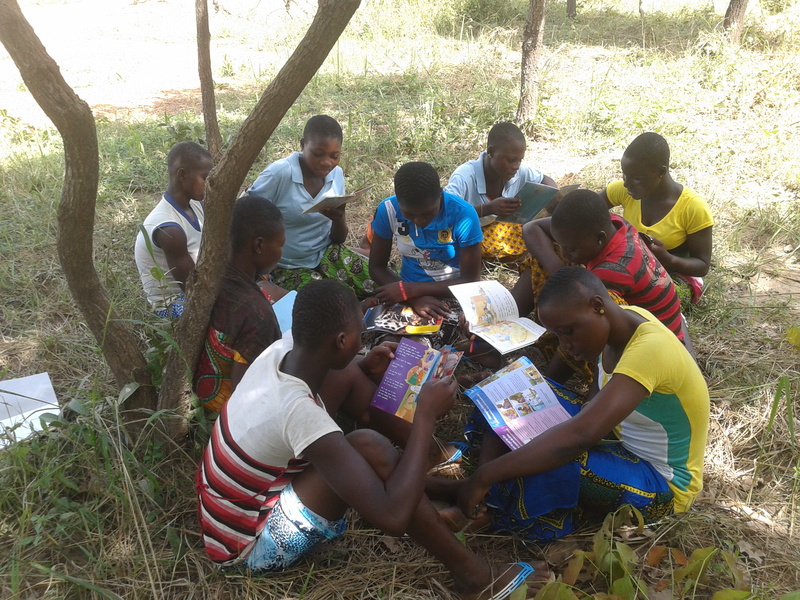 UPDATE MARCH 2013 The plan to make the library mobile has proved too costly, but the GSA grant has enabled the purchase of a wide range of fiction, some classical, some modern, including many by Ghanaian authors. The Community Library is clearly a vibrant organisation. It organised a regional spelling bee for schools, which included a partially-sighted contestant who came in 8th! 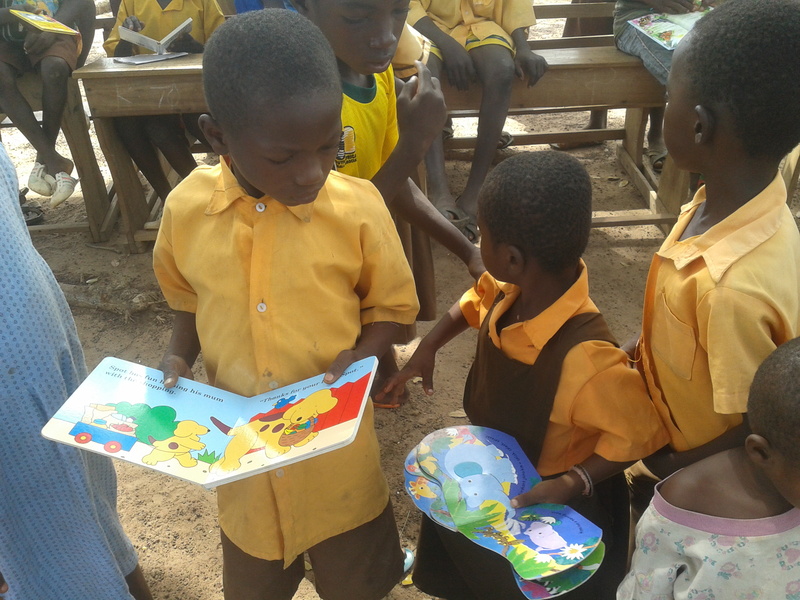 UPDATE JAN 2014 Frank reports: “We organised an event in two rural communities called LET EVERY COMMUNITY READ . For over 6 hours, close to 500 children and some parents came reading. They picked any material within their level and sat anywhere to read. It was a really thrilling experience.” Below are some pictures of some of the participants. 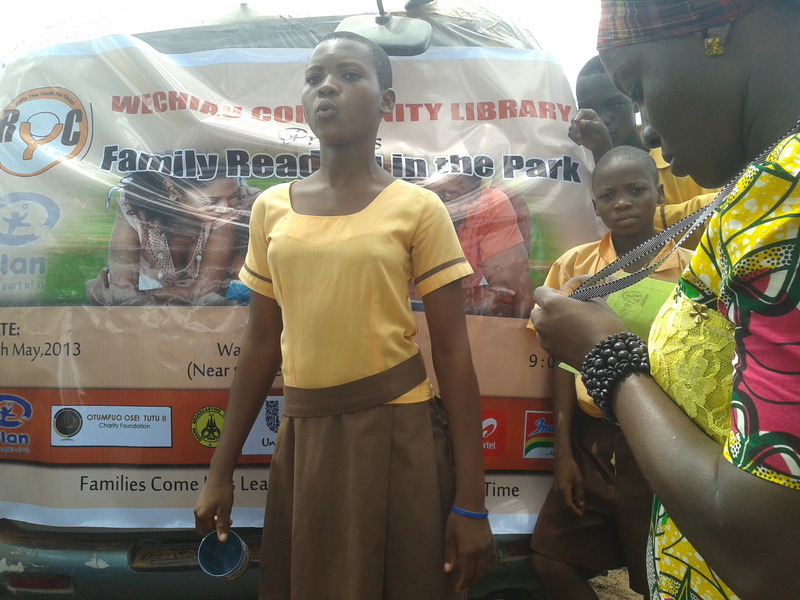 UPDATE MARCH 2016 Wechiau Community Library is the first ever Fixed and Mobile Library Service provider in Ghana. It was started by Frank Akowuge Dugasseh as a means of reducing illiteracy in the Upper West Region because less than 9% of children in primary schools can read and understand whilst 73.4 % of the population aged 15 years or older is not literate in any language. Frank started the Mobile Library Service (MLS) in Ghana with 5 old story books on a bicycle during his National Service in 2007, with funding coming from his National Service allowance. Currently, the library serves over 800 children including the visually impaired, through its fixed and Mobile Library Service. Reading materials are sent to individuals and schools in deprived communities to use and later replaced. Wechiau Community Library has also started distributing limited solar lamps to deprived children in rural communities to aid their studies at night. In September 2015, GSA sent £1000 to purchase a canopy to protect the mobile library from the elements, buy chairs, and repaint the HQ. This is the canopy. Note the Wechiau Library van in the background! UPDATE February 2017. The local authority has decided to open a library near to the Wechiau library! Frank Dugasseh has such a good record of answering community needs (and answering our questions!) that GSA looked favourably on his wish to move his operation 38 km away, to Poyentanga. We awarded a grant of £1800 to help him restart his library and community centre afresh where it is most needed. This entry was posted in Projects and tagged wechiau-community-library by Penny Sewell. Bookmark the permalink.